Yesterday police in riot gear evicted Standing Rock protesters after an evacuation deadline passed. 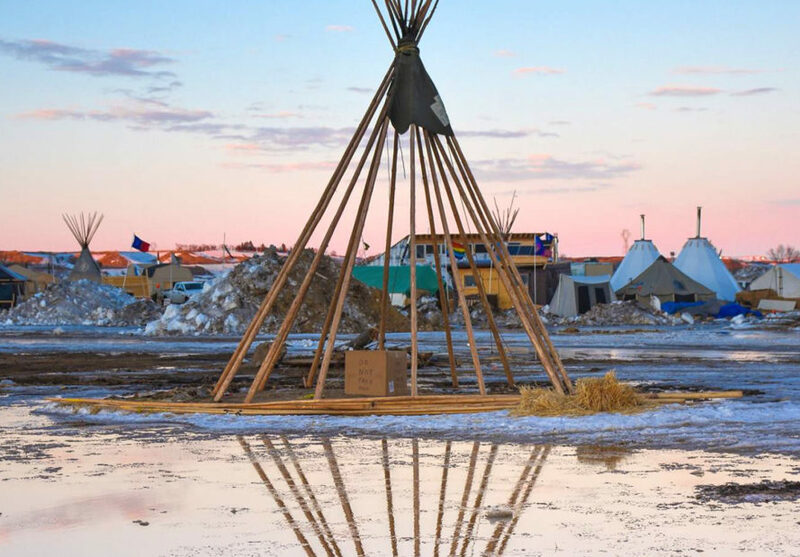 Though the majority of demonstrators left the Oceti Sakowin camp before the February 22nd deadline, about 50 Dakota Access Pipeline protesters remained. Most of these passive resistors – including veterans and tribal elders – were arrested at gunpoint by officers clad in full riot gear. The raid was livestreamed on Facebook over the course of 4 hours throughout the day. The initial evacuation was ordered on the pretext of protecting demonstrators from seasonal floods, which could potentially affect the area. While this is certainly a legitimate concern, the fact that over 200 police officers were sent to clear the area, armed with rifles and military-style equipment, makes it clear that the protesters’ safety isn’t Governor Doug Burgam’s main priority. For many of the Standing Rock Sioux tribe members, there is no “normal life” to get back to. Now that the pipeline construction is slated to go forward, they live in fear that a catastrophic oil spill could put their community’s access to clean water at peril. 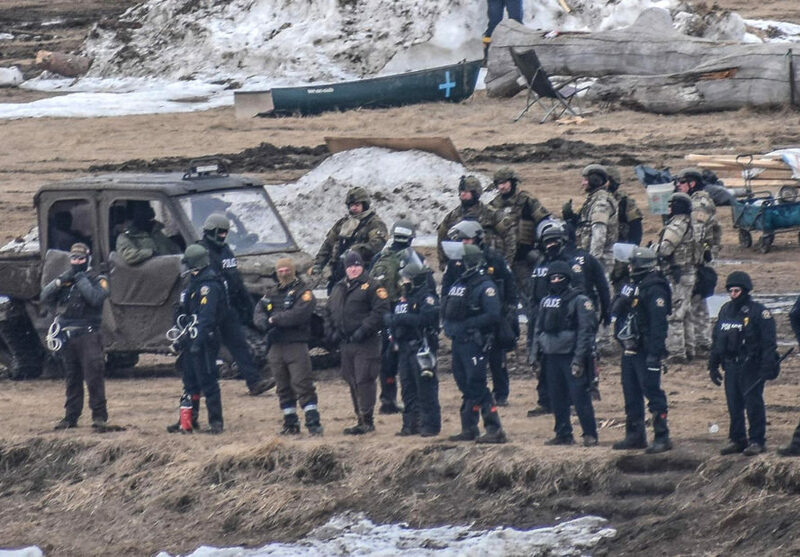 The “violence, trespassing, and property crimes” they’ve been subject to at the hands of police in the past year include being attacked by security dogs, blasted with water cannons at hypothermia-inducing temperatures, and having land they claim was granted to them as part of a 1851 treaty given away to oil companies by the federal government. Though the protests are Standing Rock have been ended by force, the movement to force banks to stop supporting the Dakota Access Pipeline continues. Oakland, Los Angeles, and New York City are just a few of the local governments urged to divest from the pipeline. Seattle has already voted to end all financial support of the project by moving $3 billion of the city’s funds from Wells Fargo. "Related: Judge throws out request to halt Dakota Access Pipeline construction" Didn't anyone see these headlines coming when they were rejoicing at Obama's and the Army Corps "decision" last fall? A tactical maneuver to encourage people to go home...which worked. Yesterday police in riot gear evicted Standing Rock protesters after an evacuation deadline passed. 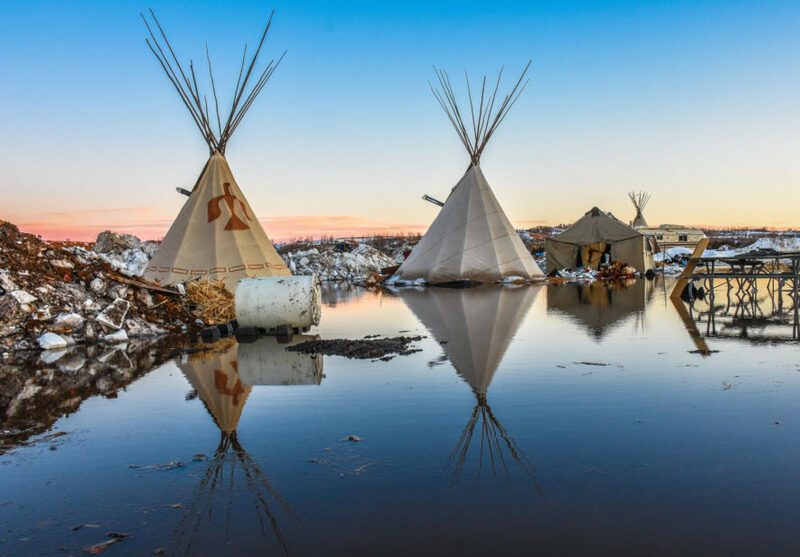 Though the majority of demonstrators left the Oceti Sakowin camp before the February 22nd deadline, about 50 Dakota Access Pipeline protesters remained. Most of these passive resistors - including veterans and tribal elders - were arrested at gunpoint by officers clad in full riot gear. The raid was livestreamed on Facebook over the course of 4 hours throughout the day. The initial evacuation was ordered on the pretext of protecting demonstrators from seasonal floods, which could potentially affect the area. While this is certainly a legitimate concern, the fact that over 200 police officers were sent to clear the area, armed with rifles and military-style equipment, makes it clear that the protesters’ safety isn’t Governor Doug Burgam’s main priority. Morton County Sheriff Kyle Kirchmeier told ABC News in a statement, “I am very happy to say that we finally introduced rule of law in the Oceti camp. For many of the Standing Rock Sioux tribe members, there is no “normal life” to get back to. Now that the pipeline construction is slated to go forward, they live in fear that a catastrophic oil spill could put their community’s access to clean water at peril. 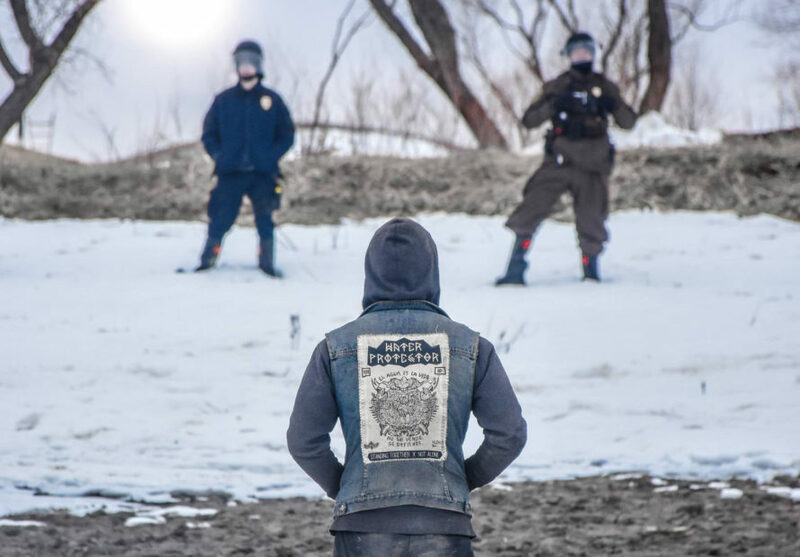 The “violence, trespassing, and property crimes” they’ve been subject to at the hands of police in the past year include being attacked by security dogs, blasted with water cannons at hypothermia-inducing temperatures, and having land they claim was granted to them as part of a 1851 treaty given away to oil companies by the federal government. The main protest site against the Dakota Access Pipeline has been cleared by armed police today, following an evacuation deadline yesterday. 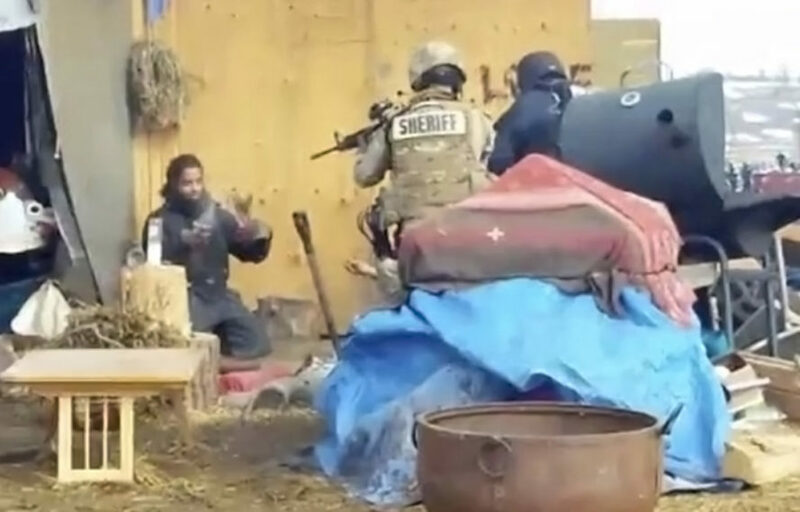 Though the majority of protesters left the Oceti Sakowin camp when ordered to disperse by the February 22nd deadline, about 50 demonstrators remained this afternoon. Most of these passive resistors, including veterans and tribal elders, were arrested at gunpoint by officers clad in full riot gear. Though the protests are Standing Rock have been ended by force, the movement to force banks to stop supporting the Dakota Access Pipeline continues. Oakland, Los Angeles, and New York City are just a few of the local governments urged to divest from the pipeline. Seattle has already voted to end all financial support of the project by moving $3 billion of the city’s funds from Wells Fargo.